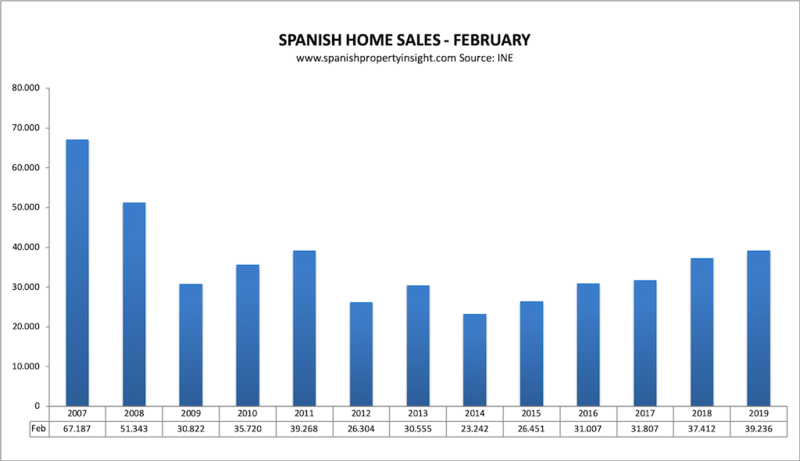 The number of Spanish home sales inscribed in the Land Registry was up 5% in February compared to the same month a year before, as illustrated by the chart above showing sales figures every February since 2007. The Spanish housing market has expanded every February for the last five years, according to figures from the National Institute of Statistics (INE), based on source data from the Spanish Land Registrars’ Association. However, the rate of expansion this february was the second lowest on record since the real estate recovery began. The Spanish property market appears to have run out of steam, for the time being at least. This may be due to the current period of political uncertainty, with a General Election due later this month. It’s a bit of a mixed picture looking at home sales in regions that most interest foreign buyers. The Andalusian province of Huelva, home to the northern half of the Costa de la Luz on the Atlantic coast, a relatively small market, increased by 56% in February, followed by Murcia – popular with British buyers – up 27%. Valencia City was buoyant (+13%), as was Barcelona (+10%). All other regions were in single figures or negative, the islands once again falling the most with the Canaries down 19% (and 29% in Las Palmas), and the Balearics down 12%. 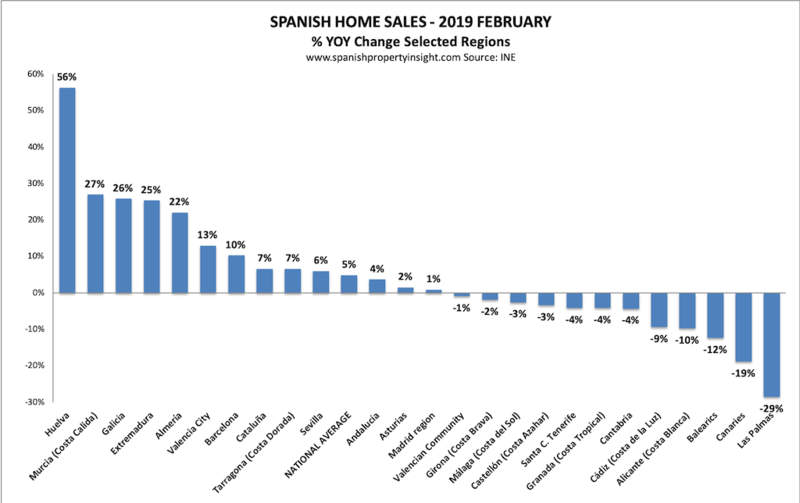 It’s interesting to note that both the Costa del Sol (-3%) and Costa Blanca (-10%) shrank in February, as they are both bellwether regions for foreign demand. Figures from the Association of Spanish Notaries based on sales witnessed by them during February show sales up 3.2% and prices up 0.7%. The data from the notaries is more timely than the figures from the INE, but they tend to be revised substantially afterwards, so I don’t take them too literally.